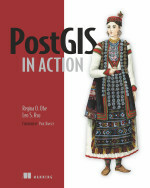 Regina Obe and Leo Hsu have a great new book coming out called PostGIS in Action. Looking at the table of contents reveals that this should be the book for learning how to use PostGIS in your GIS applications. I’m really intersted in Chapter 13, “First look at WKT raster”. Rasters seem to be pushing their way into my workflows so the more I can learn about it, the better I know I’ll be off.